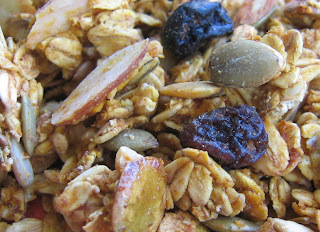 It's pretty simple to change up the flavor of your granola by adjusting a few seeds and one base ingredient. Again I found myself with some left over pumpkin and this is where it lead me - Pumpkin Granola. The addition of the pumpkin seeds (the pepitas- which you can pick up at Whole Foods) make a big difference. Also- if you do use the dried blueberries- take a few extra minutes and soak them in orange juice or they will get too dried and burnt. You do not need to do this to the raisins however. 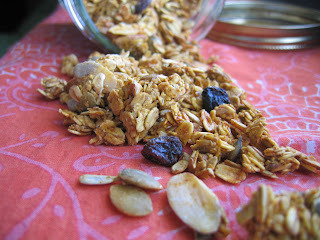 Granola stores easily in the cupboard- or store in the freezer for longer keeping. 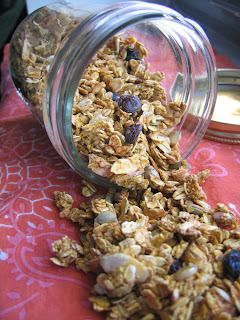 Mix up your granola today with a little pumpkin and see how often you find your had in the granola jar...after drinking! Be granola fat and happy! Add the soaking blueberries and the orange juice to the wet ingredients. Now add to the dry ingredients, mix with your hands until all is covered - don't spend too much time mixing. Spread on two lightly sprayed cookie sheets. Bake at 250 degrees. Toss every half hour until baked and crunchy. Depending on your oven, this may take 2- 4 hours. Often I'll start it the oven and toss twice, then shut off the oven and go to bed. In the morning I have perfect granola. YUMMYYYYYY!! This looks amazing! I love pumpkin!